The Petronella Guest House near Bethlehem started promoting the sanctuary to their guests. Should you require accommodation in the area, kindly give them a look as well. HuskyRomi is a non-profit organization providing a safe haven for abandoned and abused huskies and wolves in South Africa. 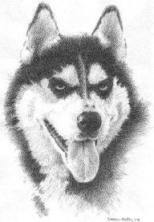 We provide a home to all huskies and wolves that can't be kept as pets, because of their complicated nature.